GuideHarkening back to the days of eTopps but merging into the modern world of sports card-based apps, Upper Deck e-Pack was recently announced by the trading card company. Similar to Topps Bunt or Huddle, the digital platform allows collectors to buy packs and open them online anywhere and at any time. However, the twist is that these are actually representative of real cards that are being opened and the physical cards can be mailed out to collectors at any point for a nominal fee. 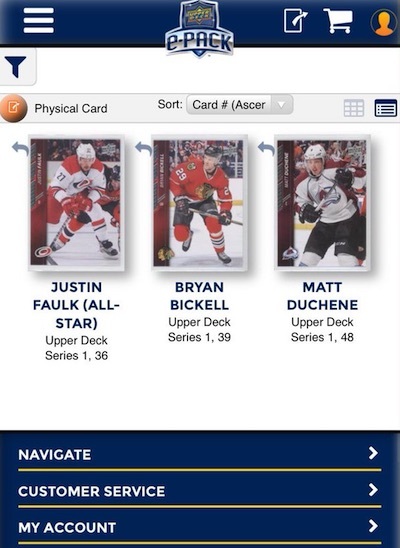 Shop for Upper Deck e-Pack Cards on eBay. "Never before has a company seamlessly connected the digital and physical world of trading card collecting" said Jason Masherah, President of Upper Deck. There is no way to replace an autographed card or a card with a piece of game-used jersey in the digital world. Using e-Pack, collectors can now easily open packs, boxes and even cases online, and then decide if they want cards delivered directly to them." Offering more convenience for collectors, while the digital versions of the physical cards can be organized and stored online, the e-Pack Young Guns, inserts and parallel cards can also be easily linked with a COMC account to sell the physical cards. COMC will also handle all physical fulfillment for the UD1 e-Pack release. One thing to point out is that the main base set (#1-200) is only available in digital form. The debut of the program includes Upper Deck Series One Hockey and was announced in conjunction with the 2016 NHL All-Star weekend in Nashville. The UD1 e-Packs will feature the regular base cards, Young Guns (Connor McDavid!) and inserts, but additionally offer exclusive content like Code to Greatness or Instant Impressions inserts. There is also a physical reward element for collecting with e-Pack. For instance, with UD1, ten copies of any one base (#1-200) or five copies of any one Young Guns card can be redeemed for an exclusive physical Silver Foil parallel card. For those wondering about how this will affect physical prints runs, the cards featured in e-Pack were set aside at the initial release. This means that e-Pack only pulls from the original run and no new cards are being produced to accommodate the program. Only a limited amount of digital product will be be made available for each release and it is expected that packs from each issue will sell out. 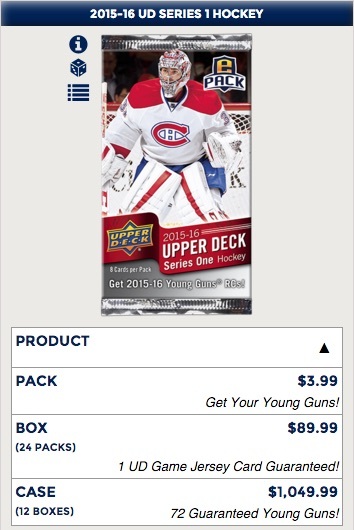 Upper Deck Series 2 is scheduled for e-Pack release on or after 3/17/2016 and another hockey product is also expected later in the 2015-16 season. Upper Deck also announced that collectors who complete the full UD1 and UD2 set (#1-500) by 8/31/2016 will receive an exclusive physical Connor McDavid Silver Foil Facsimile Signature card added to their e-Pack collection. Via a press release, Upper Deck's Chris Carlin added, "It is important to note that the three e-Pack products will not alter any 2015-16 scheduled hockey card releases available through Upper Deck’s Authorized Distributors, Authorized Internet Retailers and Certified Diamond Dealers." Collectors can open one free pack every day they check into their account and the program is live now. There is also the option to purchase by the pack, box or case. Currently, collectors will need to use the web account, but Upper Deck e-Pack app will be available for download on Google Play and iTunes in the near future. View the e-Pack tutorial video for a full breakdown of the process. Additional details can be found at the e-Pack website. Upper Deck e-Pack is currently slated for several products in 2016. The known schedule is listed below. Also, it is important to note that all future non-sport releases are eligible for inclusion in e-Pack. Visit the full details on each set by following the links. Mike Reilly 2016-17 Upper Deck Young Guns Rookie #239 Silver Foil Epack SSP!!! This is what Topps needs to do now with Bunt and especially Kick. While I don’t generally deal with hockey this is definitely intrigues me. Not the cash grab that Bunt has become. Hopefully the cost to get them sent to you isn’t ridiculous. Is there any word on a checklist of the two exclusive inserts for these ePacks? Josh � There is a checklist on the site. It would not let me copy the text but you just go to “My Collection” and click on the little icon in the top-left corner. There you can sort the cards anyway you like and also access the full checklists that are broken down by base and inserts. Thanks Trey! I see the details now. Does anyone know how to combine the Instant Impressions and Code to Greatness insert sets to get the special #0 card? I know it’s Eichel and McDavid but I cannot figure out how to combine to get them. Ryan- Once you have the complete sets click on the set in your “My Collection” under inserts and then at the top once you have the set up you click on “Combine”. What a bunch of crap. Keep the presses rolling as long as the product is selling. This is not collecting !! James – UD stated that the e-Pack product was printed at the same time as the UD1 hobby product. The only difference was in the wrapping of the product and that the overall quantity printed for e-Pack was significantly less than that of the hobby shop product. No additional product was printed for e-Pack. I thought series 2 was suppose to be released yesterday? I can’t find it. Any word on this? Do you have a case/box breakdown? I assume these packs are the same as retail even though UD shows a Auto card in their demo video. Are there any of the other hobby non numbered cards as part of these packs? I like the idea of e pack keeping the Canadian hobby shops and distributors in line with their pricing as they’re both bad for playing the limited/out of stock card and raising prices and then blaming UD. But I have heard that the e pack shipping to Canada is outrageous. And the cards aren’t well packaged. I know the e pack isn’t hobby packs but I’m fine with retail product. I’m not into numbered and case hit cards. Oooh a clear cut SS. :/ Who cares. If I want that card, that’s what ebays for. HH � 3/17 was the earliest possible release date for Series 2 on e-Pack. No word on the exact date so far. Trey, UD told me to check cardboardconnection for the Code to Greatness and Instant Impression odds, since not available on e-pack anymore w/ the sold out aspect. Do you have this? Thanks. Roman � We don’t have the ePack odds. 2015 16 Upper Deck Series 1 Hockey 24 Pack Box Factory Sealed Packs McDavid RC? 2015 16 Upper Deck Series 1 Hockey 24 Pack Box Factory Sealed McDavid RC?